Red kangaroos are the largest of the extensive kangaroo family and are particularly at home in dry country one of the hottest places on Earth. All mammals can sweat, but with water in short supply, they only do so when they're on the move. They make use of whatever sparse shade they can find but also use saliva which they wipe on their forearms to help lose excess heat. There's a rich supply of blood vessels close to the surface of the skin and as the saliva evaporates, the blood cools. It's hard not to notice the odd way these animals get about and the advantage of their unusual proportions becomes obvious. 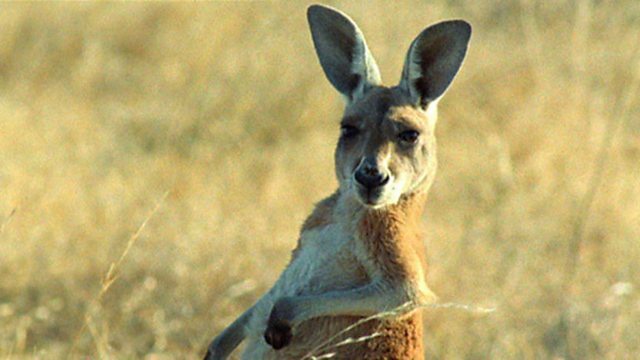 Tendons in the back leg act as giant springs storing energy as the kangaroo lands and then releasing it to propel them forwards again. This is a highly efficient form of recycling which means that at full speed the kangaroo could outpace a race horse. Cheetahs, falcons, elephants and whales - meet the animal record breakers.